Mount up to 55 lb projectors with Atdec's versatile and secure TELEHOOK Flush Projector Mount. Attach the mount flush to the ceiling or incorporate any optional mounting pole with a standard 1.5" thread interface. 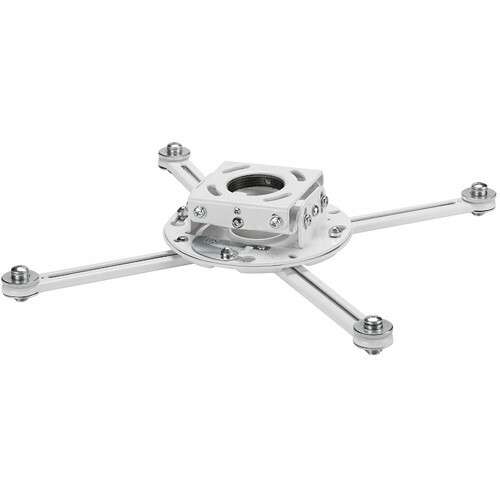 The mounting brackets are extendable to support a wide range of projectors, and the flush ceiling mount offers high levels of tilt, pitch, roll, and yaw adjustment, allowing you to fine-tune your projector to just the right viewing angle. Security features are integrated throughout the design to ensure projector security in public environments. Installers will appreciate the time-saving installation features that allow the mount to be set up quickly and securely. Box Dimensions (LxWxH) 9.1 x 7.1 x 2.6"